Filed to: rain rain go away?Filed to: rain rain go away? When it rains it mudslides. That, at least, is the saying in California this week, as the aftermath of one of the state’s worst fire seasons converges with some of the state’s first big rains in nearly a year. After experiencing a record-low 0.69 inches of rain between March and December 2017, the area between Los Angeles and Santa Barbara is finally getting some much-needed moisture. The region could see downpours of more than an inch of rain per hour through Tuesday. Unfortunately, because the region also just experienced some of the worst fires in state history, leaving steep slopes devoid of vegetation and covered in ash, it could also see massive mudslides. To prepare for this disturbing scenario, around 30,000 people have already been evacuated in the Southern California. People living alongside hilly topography in Santa Barbara and Ventura counties—where the recent Thomas Fire and other fires burned hundreds of thousands of acres less than two months ago—are being asked to evacuate, again. Rivers of mud and debris have already destroyed at least three homes in the coastal community of Montecito, just south of Santa Barbara. 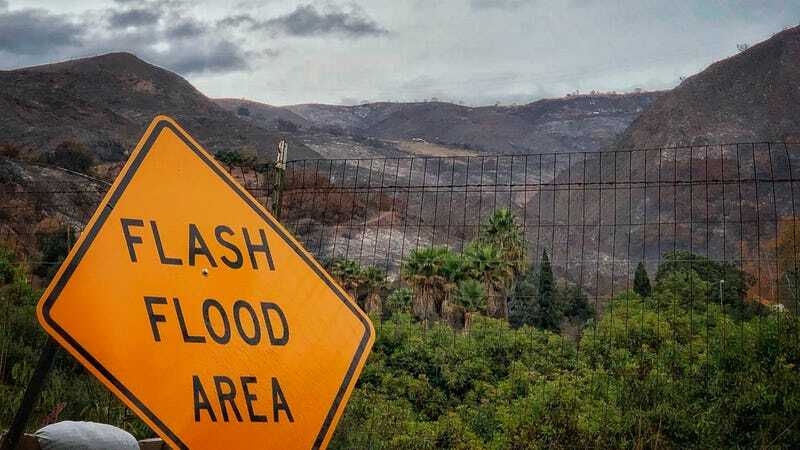 If that wasn’t enough bad news, the 101 Freeway between Ventura and Santa Barbara, the main traffic artery traversing a small strip of land between the coastline and the hills, has been shutdown as the rains have generated flooding, debris flow, and a possible gas leak. The northern part of the state will not be spared, either. Up to four inches could come down by tonight north of the Bay Area, raising the specter of large mudslides across another region still recovering from widespread wildfires late last year. Flash flood watches have been issued for parts of Sonoma and Mendocino counties north of San Francisco. Santa Rosa, which was hit especially hard by the Tubbs Fire in October, saw more than an inch of rain on Monday. “City crews are actively driving around looking for signs of any flooding, mudslides, things of that nature,” Santa Rosa Assistant Fire Marshal Paul Lowenthal told the AP. The burned areas clear a path for rocks and debris that otherwise would have probably have been contained during a flash flood. Tree roots are also crucial in holding soil together along steep topography, and with that natural support removed, the land becomes much more susceptible to mudslides. This is especially the case in drought-ravaged regions where the soil is too dry to take in large amounts of water very quickly. In these patches of particularly high burn intensity, nearly all vegetation was consumed by fire–leaving steep slopes completely devoid of soil-anchoring vegetation, and even modifying the underlying soils in a manner that creates a largely impermeable, waxy layer. This means that rainfall has a very hard time soaking into the ground—and is instead forced to immediately flow downhill as nearly instantaneous runoff. Watching this video, it’s easy to see why. The worst of Southern California’s first major storm in nearly a year will move inland by Tuesday night, but not before hitting the area with some more heavy wind, rain, and lightning. Storm watches area already in place from Colorado to Wisconsin in anticipation of the powerful front. Once the worst passes, the benefits of the rains will be welcomed, as reservoirs were starting to drop after being refilled to capacity nearly a year ago. After emerging from a crippling five-year drought last winter, most of the state remains in the clear for now. Update, 1:00 pm: At least five people died overnight due to mudslides and flash flooding in the Santa Barbara area, according to officials.